Pinterest is HUGE! Here's 5 Ways to Harness its SEO Power! All we are hearing these days from our clients is Pinterest this, and Pinterest that. Most want to get their companies set-up with a profile. Can you provide us with some quick tips on how to best optimize them and attract followers. Is Pinterest really something that most clients can utilize, or is there a specific niche for which it's best suited? Answer: It's certainly hard to ignore Pinterest with the amount of press it's been getting lately. The site is not only the FASTEST growing social media site in history, with a 4000% traffic growth in just the last six months, but it's also able to send massive amounts of traffic and is becoming a game-changer for small businesses nationwide. Currently, Pinterest ranks as the third most-visited social networking site trailing only Facebook and Twitter and is one of the top 30 most visited sites on the Internet. Even more impressive, users of Pinterest spend more significant time on the site (an average of 15 minutes per visit) than they do when compared to Facebook and Twitter. 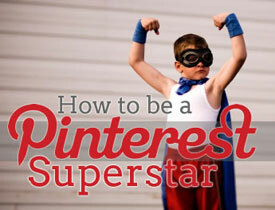 Bottom line: if you aren't on Pinterest now, you should be, regardless of your niche!